Technology is rushing to the aide of today’s over-worked, under-resourced corporate legal departments. But what do the promises of greater impact, enhanced transparency and improved efficiency mean in practise? What can ‘intelligent platforms’ do for data control, workflows, business models and more? 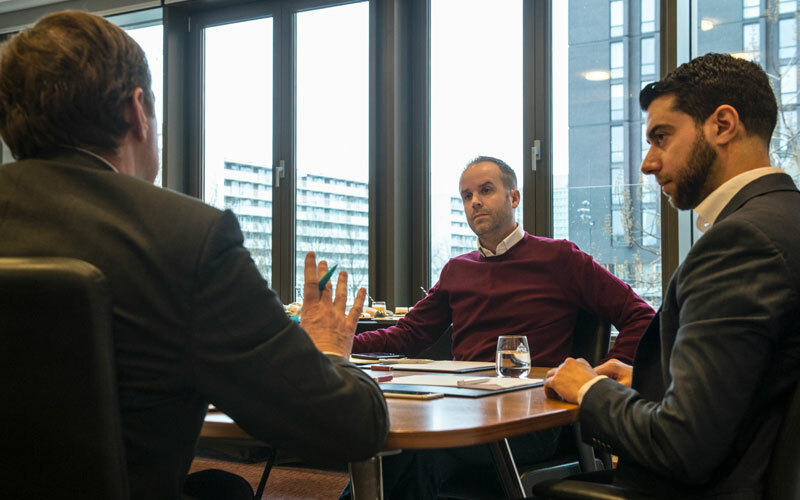 Rob MacAdam, Director of Legal Solutions at HighQ talks tech with Legadex’s Luc van Daele and Morad Kada. Luc: Rob, as you know, we have used the HighQ intelligent platform for several years, and we see that tools like the virtual data room and collaboration are evolving to become an integrated platform. I think this could benefit our customers, the corporate legal departments and their clients. Do you agree? Is this where HighQ is going? Rob: I do. HighQ began with a focus on secure file sharing, data rooms and extranets. It was very basic, but we were doing something that a lot of people weren’t. We focused predominantly on the law and financial services sectors, and we made big inroads with those use cases. We signed up banks and law firms and that elevated us to the position we are in now in terms of our client base. Now, over time, we have layered on functionality to evolve the platform. From document sharing and data rooms, we layered on collaboration because people were asking for this. This introduced things like wikis, blogs, tasks. Next, we added a data layer so clients could collect, structure, record and play back data on key projects. More recently we added an intelligence layer with things like data visualisation, workflow and the AI hub. This evolution is enabling us to optimise legal service delivery, whether that’s law firms, or, as you say, corporate legal teams. There’s a toolset that allows corporate legal teams to do very exciting things in the way they work internally and interact with their business, vendors and outside counsel. Morad: Before talking about corporate legal opportunities, I’m curious how your law firm clients use the HighQ platform. Is it mainly for collaboration or do they use it for other things as well? Rob: It’s predominantly extranet, secure file sharing, data rooms. But, increasingly, they are realising that they are missing a trick. If you look at the anatomy of a legal matter, it involves team collaboration, document sharing, project management, knowledge management, process and service delivery. So, we’re now seeing more clients using HighQ to deliver status information and matter information to their clients, as well as project management reporting and taking instruction from clients online through the portal. As a result, these client portals are starting to become relationship and service delivery gateways that offer other value-added solutions beyond basic legal advice. Morad: That’s my experience with HighQ: working on a project basis, where we share our documents and provide access to clients. Rob: Yes, I believe that you’re using the transactional aspects of the platform – data rooms – which is what we did when I was an M&A lawyer for a HighQ client. Data rooms are great on the sell side and it led me to wonder how this could work on the buy side. We therefore developed a system where we used HighQ to capture deal and due diligence information and data in a structured way. This enabled us to use data visualisation to track key metrics for each deal. Next, we used document automation to create reports from that data and so redefine how the buy-side process was conducted and delivered to the client. We achieved all this using the HighQ platform. Luc: I’m curious whether you see a big difference in the use of the platform by law firms in the UK, the US and continental Europe? Rob: I see a difference between Europe, including the UK, and the US. European law firms are more open to new technology and new ways of doing things. There’s a much bigger appetite in Europe for using our platform to turn client extranets into full client relationship portals and to create new and innovative service delivery tools and solutions. In the US, the focus is still on some of the more basic use cases. On the flip side, there tends to be a much bigger focus on legal operations in the US, and we see this with the rapid rise of organisations like CLOC [Corporate Legal Operations Consortium] for which technology is one of the core competencies. Rob: It's fascinating. I've been a private practice lawyer, worked in technology for law firms and now, increasingly, I’m focused on corporate legal and I really like what’s happening in this space. The rise of legal operations and the focus on technology to help streamline and simplify the way legal departments work, collaborate and engage is genuinely exciting – in-house teams are definitely driving the legal innovation and transformation agenda right now. Luc: Do you see the rise of Legal Operations within corporate legal departments as a reflection of the trend among law firms to use technology as a differentiator in their service delivery? Rob: I think it’s a reflection of legal departments wanting to take more control and more effectively deal with the pressure they are facing internally from their organisations. For example, more legal departments wanting to control their own documents and data, and not rely on outside counsel. When a system is provided by external law firms, the data is controlled by them. But in-house teams increasingly want to own and hold their own data. It's all about control and having the flexibility to use who you want for certain pieces of work and not being tied in to any provider. Luc: I agree, I think there is a fear in legal departments of being locked in. You also mention flexibility and I would say that one of the benefits of the HighQ platform is that it allows companies to allocate work in a different way. They can use it to create workflows and allocate work internally and externally, including to alternative legal providers like Legadex. I would say that's the new playing field. Do you agree Rob, Morad? Morad: I do. HighQ makes it possible for legal service providers to assist companies with the data and process side of the workstream. Law firms focus on content and look at the work from a primarily legal perspective; they don't have an eye for the process side of things in the way the alternative legal providers do. So yes, I do think this flexibility is the new playing field, but Rob, do you see companies engaging more with legal service providers? Rob: Certainly. Flexibility is one of the key things in Legal Operations and organisations such as CLOC talk about vendor management and legal vendors – not outside counsel management but vendor management – which can be both law firms and alternative service providers. Corporate legal teams are now being smarter in how they are apportioning and resourcing their legal work. Luc: And that – how they are apportioning work – leads me rather neatly to use cases for HighQ in the corporate legal environment. What sorts of opportunities do you see? Rob: As a platform, we can help optimise a wide range of activities across legal teams. We’re redefining ELM [Enterprise Legal Management] for legal departments. ELM has traditionally focused on spend and matter management, but I think it is becoming a much broader concept. This is why the term Legal Operations Management and the concept of a legal operations platform is starting to replace ELM. Morad: And what do you think is driving the move away from ELM to platforms and operations management? Rob: It’s because a platform lets you do everything: contract management, matter management, document management, vendor management, risk management, NDA generation, outside counsel collaboration and more. All within a single hub. A matter management system is something that many in-house teams lack. We can give corporate legal teams a platform to help them efficiently manage and track their workload. That’s really useful, because nine times out of 10 they track their matters on a spreadsheet, which is completely inefficient. Our core use cases also include legal intake with self-service tools and escalation mechanisms, self-service guidance and knowledge and know-how delivered to a legal team’s business clients through the platform. But the platform can also be used to help the business instruct the legal team in a standardised way. And because the system gathers information in a structured way, it can be used to analyse and report legal workload, organisational pressure points and potential risk areas, enabling the legal team to make better, data-driven decisions. The ability to collect metrics is also critical for legal teams because they struggle to evidence their value. They are just seen as a cost centre. We can help them to demonstrate how valuable they are, which is a great story to tell. Morad: You’re saying that having a platform helps people all over the business and not just in corporate legal? Rob: Yes. The HighQ platform helps optimise engagement and collaboration between the legal department and the business. Not only can the platform be used to deliver self-service tools to business users, it can be used to instruct the legal team and surface reporting metrics to demonstrate the value of the in-house team to the wider organisation. By using workflow in the platform, instructions from the business can be directed to relevant the lawyers or teams based on where it's coming from, the type of work it is and so on. You’re using insights from the data to drive dynamic workflows and make business engagement more efficient, and the legal department more valuable and responsive. HighQ can also benefit vendors and outside counsel, as well as the legal team and business users. Luc: I’m wondering Rob, hearing you talk, if there is a minimum requirement or size for a legal department or team to take advantage of the HighQ platform? Rob: The corporate legal landscape and legal teams vary so much that it's very difficult to draw a line. I would say we have huge application from a two-person team all the way through to a large enterprise legal team of hundreds. But the use cases will vary. For smaller teams, it is more about tackling matter management, contract management and document management within one platform. For larger legal departments, it's more about the use cases we traditionally discuss with law firms, such as data rooms, extranets, document sharing and knowledge hubs. Morad: Moving to something like HighQ also involves a new way of thinking. Companies that are used to SharePoint, for example, have to start thinking and working differently to get the most out of it. It’s a change of mindset. Rob: It is. It’s the speed – I can get a simple site up and running within minutes – plus the site is accessible both internally and externally. It’s the ability for our clients to invite their advisers and other stakeholders into the system to begin collaborating immediately. You don’t get that agility with SharePoint. But it’s also about realising that HighQ is accessible and usable by your own internal users. With SharePoint, you often have to go to the central team to get things done. With HighQ, a user can create their own sites using our digital toolkit, which is why we say that HighQ democratises creativity within our law firm and corporate legal clients. If someone has an idea for improved legal service delivery, they have the tools to enable them to quickly deliver value. Luc: Nice phrase. We’ve talked about the link between legal operations and legal tech and platforms. We also see some other trends in the way of working, like Agile and Lean. I’m just wondering to what extent the HighQ platform can support Agile working within legal departments and within companies? Rob: There are a couple of ways to look at this. Platforms are perfect for teams to operate in a Lean way. The Lean method is about constantly adapting, changing and iterating. In terms of Agile working, the platform, with its modular approach and flexibility lets you create what you need and do what you want. And because it’s accessible from anywhere, at any time, it empowers people to work in an Agile way. Luc: It doesn’t force you to work in a particular way or use specific software? Rob: No, because the HighQ platform is cloud-based Software as a Service and we constantly look at what integrations we need to enhance the workflows of our clients. So, we support DocuSign, for example, and though we have our own AI hub with our own AI engine to analyse documents, if you want to use Kira or Leverton, that’s fine. We’re neutral. Rob: Exactly. If you want to use Google Docs rather than Microsoft – fine. However you want to work and whatever productivity tools you use, we want to make sure you can. Luc: Sadly, we are out of time. Just to come back to where we started, where do you see legal tech and the legal industry going? Rob: The law firms have gone through a journey in the past few years. Many have developed innovation or service delivery teams, and there is no shortage of submissions to the FT Innovative Lawyer awards. This is obviously great for them from a PR perspective, but a lot of their clients are not seeing that much difference and are not receiving the value they desire. Corporate legal departments are therefore taking matters into their own hands, especially with the rise of legal operations. The next few years in legal technology will be defined by in-house, not private practice. I think it’s a really exciting time to be working with corporate legal teams because they are the people at the coal face trying to find solutions to deliver business value and mitigate risk. It’s genuine innovation and we’re excited to be helping. The HighQ intelligent platform – is it for you? Legal intake and self-service: create portals (legal front door) for internal clients to request legal support, generate template contracts and access legal guidance. Matter management: transparently manage matter portfolios, track status and risk, generate reports and gain full visibility into legal work in progress and workload. Contract management: efficiently manage contact lifecycles with automated workflows to optimise contract creation, analysis, negotiation and execution. Document management: centrally manage and share legal documents with version control, DRM, advanced permissioning, custom meta data and more. Further use cases: outside counsel management; board management; NDA management; knowledge management; IP management; legal team sites. HighQ empowers leading corporate legal departments to transform and optimise the way they work, manage legal operations and deliver value to their business. HighQ unites internal and external teams with solutions for legal service requests, document management, matter management, contract management and more, enabling legal departments to drive efficiency, increase productivity, mitigate risk and deliver business results. The HighQ platform is flexible, user-friendly and integrates with other leading-edge technology to provide a seamless user experience and maximum return on investment. Founded in 2001, HighQ has grown to a team of more than 350 and is headquartered in London with offices in Kansas City, New York, Amsterdam, Frankfurt, Sydney and Ahmedabad.